You'll need the AppARition app to see 'em. First there was just one Dornier, preserved at RAF Cosford, then it had a virtual counterpart that visited select museums. Now Wargaming.net is spreading the German bomber all over the world like some kind of airborne virus, and encourages you to seek it out and take photographs. You'll need the AppARition app to find it, but once you've got that, there's any number of places you could go to see it in person. If you happen to be near one of Wargaming or Alienware's offices, passing through Caracas, visiting Volcano museums, seeing the sights in Jianguomen, China, or somewhere else altogether, there's a decent chance of finding one. There's even a small competition going on. 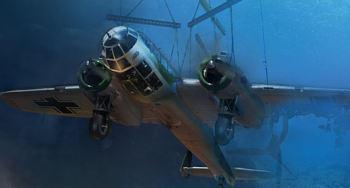 If you want a chance to have a picture shown at Wargaming's next exhibit at RAF Museum London, submit a shot of the Dornier, with your name and location. Details found over here, if you're feeling keen. That's a pretty clever marketing trick, I must say... I still don't want anything to do with World of Warplanes however.